Thread: The Peter Phillips Collection. I am not really a collector of keys and locks but I inherited an interest from my late father who was a locksmith and safe engineer, together with some of his tools and equipement and key samples etc. Yesterday, as a member of the local brass band, I attended the Navestock Flower Festival which is held anually at St Thomas the Apostle Church near Ongar in Essex. I was reminded of the first time that I visited this event some 30 years ago when it was much larger and more prestigous. On that occaision I was privaleged to see a most interesting collection of locks and keys which I, and my wife, have never forgotten. The collection was the life-time work and accumulation of Mr Peter Phillips, who although an elderly man, was present and taking a great interest in the proceedings as several of his younger assistants showed and demonstrated the vast collection of exhibits. These included Roman padlocks, reproductions of Egyptian and very early locks, giant Victorian presentation keys as well as antique locksmiths tools and lock-picks etc. Many of the items had been beautfully repaired and restored by Mr Phillips as evidenced by the many photographs and I remember being very impressed with his fine welding and metal manipulation skills. When I became involved with motor restoration several years later I became even more impressed with the high level of craftsmanship that I had seen that day! As I remember, Mr Phillips was a stocky man well into his seventies, used a stick, but still retained an intense and energetic persona,....I remember that the only time he spoke or interrupted the demonstrations was to respond with great irritation to a flippant remark by one of the audience. So, for the last 30 years or so I have often wondered; who was Mr Phillips, why did he bring his incredible collection to a flower festival in the middle of Essex and what eventually happened to his lifetimes work and passion?? Re: The Peter Phillips Collection. I never met Peter, although I can answer the last part of your questions. His collection was finally sold off after he passed away. The auction was at Sothebys in November of 2002 and the total value of the sale was over two hundred thousand pounds (I think - I cannot locate my copy of the realization list). I attended the auction however was unable to buy anything there such was the competition amongst collectors. I did however later acquire a fine Parnells key that is shown elsewhere on this site. I do know that Peter showed his collection widely during his lifetime, as to why at a flower show - it maybe that it was closed to where he lived, or perhaps he liked flowers too ! I don't have the answers to those questions, maybe others do. My understanding is that Peter Phillips was an engineer and in his middle age became a lock restorer. He was obviously a perfectionist. I saw his display at an antiques fair at Kimbolton. I was most impressed when I saw his display, even the boards were a work of art. He did not sell anything - simply displayed his boards. I enthusiastically introduced myself - "...I run a locksmiths business" said I... "oh yeah...right..." said he and turned away. I think the term 'old codger' was coined specially for him. I had the privilage to buy a couple of his boards of keys - the rubbish ones no one else wanted! Plus a couple of other things. The very sad thing is this collection could have been donated to a museum and his name would have lived on for ever. Sadly he left it too late and I suspect was poorly advised - or would not take advice. The stuff was distributed far and wide. One lock was sold for £25,000 plus 17.5% commission. Some single keys went for £6,000 each. It was a fabulous jaw dropping day - never to be forgotten. Don't know if anyone else on the forum can shed any light on the man, the sale or the contents. I suggest it would be an interesting thread all of it's own. Maybe thats what we have here? [I knew Peter and Vera Phillips for about fourty years,I met them when we bought a house in High Ongar Essex .Veras family were landlords of the Red Lion public house during the war years and they will be remembered well in the village. Peter went up and down East Anglia to country house sales looking for anything to do with his collection he was also very interested in Egyptolegy his whole life was locks and keys and on my wedding day he brought some to show the guests,I will never forget the pair of them. 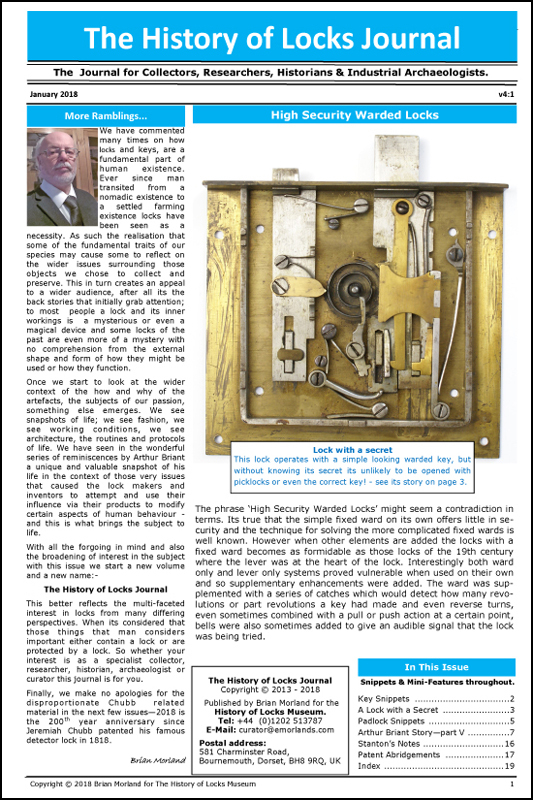 QUOTE=Buglethree;1405]I am not really a collector of keys and locks but I inherited an interest from my late father who was a locksmith and safe engineer, together with some of his tools and equipement and key samples etc. Athough I never met Peter Phillips personally, I was familiar with his name and outstanding collection. The late Jim Evans sent me a copy of Bygones 5 (1980) that had an article he wrote entitled "Locks and Keys" (pp. 81 - 105). The article was illustrated with items from his personal collection, and they were of museum quality. He had a very impressive collection! I and many others would love to see your pictures of the collection. Please and thanks. Peter was my uncle and I, as a layman found both he and his collection fascinating. I cannot add much about his collection but thought that some of you. particularly those who met him, would like to know a little more about him. He had an extremely healthy ego and needed to be centre stage and, as the first post suggests, he would not tolerate anyone not hanging on his every word. He was a conscientious objector during the second world war, but served as a fireman, dressing me up for a photo in his helmet and other items. I would have been about 7 at the time. At this time he lived with my family in Redditch. I can picture him now 'restoring' a pinstripe suit by painstakingly dotting ever pin with blue oil paint, which must have taken him weeks. When I was Chairman of Redditch Round Table he kindly brought up his boards and other items to give a talk at one of our meetings. They were so heavy that his old Volvo adopted the attitude of a plane about to take off. His irascibility was demonstrated when he had a blazing row with the photographer of a local paper which resulted in the photographer storming out. The photographer naturally wanted as many of us as possible in the picture, as that is what sell local papers. Peter was understandably enraged that people would block out his collection which he had brought up from High Ongar to Redditch. His brother, my father, was equally stubborn and Peter and he rowed over whether Peter was a Master Locksmith as I believe he had been made an honorary member, but dad maintained he wasn't as he had never been a professional locksmith. A silly row which left them estranged for years. Peter married Vera, who looked and dressed like a film star and put her on a pedestal, wouldn't let her do much housework, but she did have a small business in used posh dresses etc. Regarding his collection I remember so much of it, such as the Cavaliers leg and the chastity belt. Perhaps that was why they had no children! My favourite was an American time lock introduced as I am sure you all know to reduce the number of kidnappings of bank managers at night as they could not open the safe. I always understood that an American, possibly one of the two mentioned in a previous post, paid Peter for his collection to be passed to him on Peter's death. Sadly, for him, the American died first so he never had the collection. As a family we have fond and irritating memories of him, but always admired his dedication and workmanship. I hope that this is of interest to those who knew him. Personally I have always wondered how much the time lock and the chastity belt made at the auction.